As January goes, so does the year? “As January goes, so does the year?” is a conventional saying that equity market returns in January are a precursor of the performance over the next 11 months. This is commonly referred to as the January stockmarket barometer. Statistical studies suggest that this is more accurate when equity markets perform positively in January and during the rest of the year. In fact, since 1896 when the Dow Jones Industrial Average index in the US started being computed, the January barometer was accurate for a large majority of the times when the performance was positive. On the other hand, however, the January barometer is not as accurate when markets perform negatively in January. Many investors hope that this is also true this year and the steep decline in January 2016 will not reflect an equally negative full-year. Following the disappointing performance and volatile conditions across international equity markets during 2015 as explained in my recent article, few investors could have possibly anticipated the magnitude of the downturn and volatility during the first month of 2016. All the main global equity market indices registered considerable losses and by the fourth week of January, equity markets in the UK, France and Japan also entered into bear market territory (i.e. a decline of more than 20% from their previous peaks). Equity markets staged a partial rebound during the last week of January on indications that the European Central Bank (ECB) might loosen its monetary policy further at its next meeting in March and an unexpected interest rate cut into negative territory by the Bank of Japan on the last day of January. The worst performer by far was China’s Shanghai Composite Index with a decline of 22.6%. The month of January was off to a very negative start for the Chinese equity market as fresh data confirmed that the manufacturing sector shrank for the fifth successive month, possibly leading to the slowest annual growth rate for the last 25 years. In fact, during the first trading day of the year, the market was briefly halted following a 7% decline in the index. The erratic intervention by the Chinese authorities to stem the declines across the stockmarket triggered widespread chaos across the globe. The “circuit-breaker mechanism” – allowing authorities to halt trading if the market drops steeply – was used on various occasions in China during the first week of the year. After the use of this mechanism was suspended, state-owned institutions intervened in the market in order to offer support while regulators extended a ban on sales by leading investors. The Shanghai Composite Index ended the first week of 2016 with a decline of 10%. The severe downturn in China had an immediate impact across all major equity markets. European equity indices registered their worst start for the year since 2000 whilst those in the US (namely the Dow Jones Industrial Average and the S&P 500) incurred the worst declines ever in the first week of the year. Germany’s DAX30 shed 8.3% and the CAC40 in France retreated by 6.5% during the first week of January. In the US, the Dow Jones Industrial Average dropped 6.2%, the S&P500 registered a decline of 6% and the NASDAQ slumped 7.3% by the 8th of January. Although none of the other global equity markets closed the month with double-digit losses like in China, all performed negatively. In the US, the S&P500 index shed 5.1% and the Dow Jones Industrial Average dropped 5.5%. The NASDAQ market registered a weaker performance of 7.9%. Across the larger EU markets, the German DAX 30 was the worst performer with a decline of 8.8% while the French CAC40 dropped 4.8%. Meanwhile, in the UK, the FTSE100 ‘only’ declined by 2.5%. Apart from the Chinese economic slowdown, the other major factor impacting equity markets during the past few weeks was the decline in the price of oil to a 13-year low. Although a cheaper oil price ultimately enhances consumer spending and therefore boosts economic activity offsetting deflationary worries, the immediate concern is that the slump in the price of oil is hurting profitability of energy companies, miners and companies in other sectors including banks which are exposed to such indebted companies. In the latter part of the month, the price of oil rebounded on hopes that some oil-producing countries could reach a deal to tackle the over-supply. The timing of interest rate hikes by the Federal Reserve in the US was one of the main themes during the final part of 2015 and continued to dominate the headlines in the first few weeks of the New Year. Following the ultra-loose monetary policy in the US since 2008, the US economy grew steadily with the rate of unemployment declining sharply from 10% in October 2009 to almost full employment at 5%. On 16 December 2015, the US Federal Reserve lifted the target range for its benchmark rate from 0% – 0.25% (first adopted in December 2008) to 0.25% – 0.5%. At the time of the December rate hike (the first increase in rates since 2006), various officials at the Federal Reserve had claimed that the central bank aims to gradually increase rates throughout the course of 2016. The impact of rate hikes on the US and also on other global equity markets was also a factor that caused concern among investors over recent weeks. Despite the sharp decline in the price of oil and the global stock market turmoil, during the meeting held on 27 January, the Federal Reserve said it was assessing “readings on financial and international developments”. However, it again signalled a willingness to continue tightening monetary policy during the course of 2016. 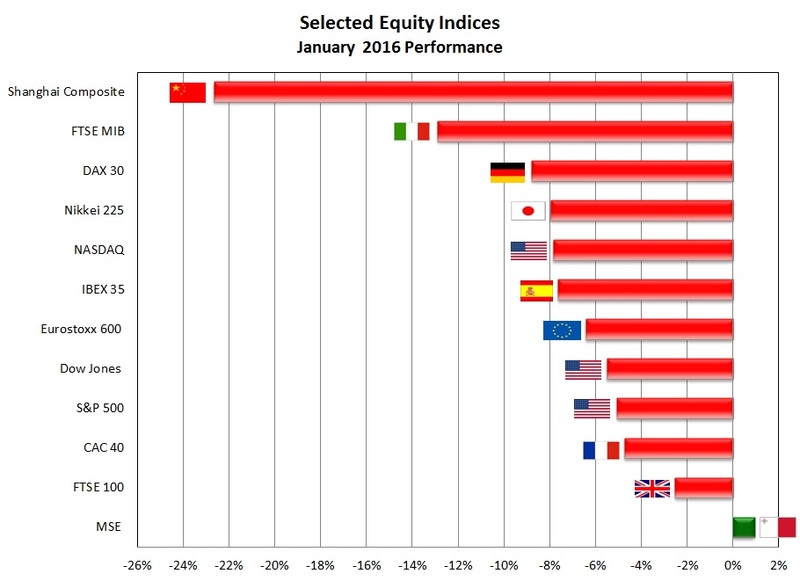 As global equity markets gyrated, the local MSE Share Index continued along the same positive trend of 2015 and edged up by 0.9% during January 2016. Since the MSE Share Index was computed in December 1995, the January barometer has been correct for 70% of the times. In other words, over the past 20 years, a positive or negative January for 14 of the years led to a similar movement for the entire year. Local investors would hope that the barometer is also correct for 2016 building up on the very positive momentum in 2015 when the local market strongly outperformed international markets. However, this will be very much dependent on the reporting season and the extent of dividend distributions to shareholders as well as individual company developments. The major factor that could impact investor sentiment is the expected takeover of GO plc. While the international equity markets suffered steep losses last month, how did the bond markets perform? Eurozone bond markets rallied as the benchmark 10-year German bund yield dropped by 30 basis points. During the final trading day in January, the 10-year German bund yield declined to 0.32% – the lowest level since April 2015 shortly after the start of the Quantitative Easing programme by the ECB. While the positive performance reflected the continued low inflation rate of 0.2% across the Eurozone in December (far below the ECB’s target of just under 2%) and the conclusion of the ECB meeting on 21 January that further easing may be announced in March, the decision by the Bank of Japan to introduce negative rates led to a further rally in Eurozone bonds during the final trading day of January. Although Malta Government Stock prices generally mirror the movement in yields across the Eurozone very closely, the Rizzo Farrugia MGS Index increased by ‘only’ 1.3% in January to its highest level in 6 weeks while the 10-year German bund yield dropped to 9-month lows. So what should investors expect across international equity markets in the months ahead. Monetary policy will be a key determining factor affecting the future direction of the equity and bond markets throughout the rest of 2016. Following the surprise announcement by the Bank of Japan on 29 January, the focus will shift on the ECB and also on the Bank of England to see how they will respond to this latest move. More importantly, the decision by the Fed on whether it will stick to its original plan of increasing interest rates gradually or whether it will retract and delay any further hikes will also largely influence investor sentiment. The other themes that were in the spotlight in recent weeks, namely the movements in the price of oil and data on the Chinese economy, will also continue to provide direction to the markets. Political developments are also likely to be important factors affecting sentiment during the next few months. The main political risk could be the referendum in the UK on its departure or otherwise from the European Union (‘Brexit’) as well as the presidential elections in the US. Other notable developments in the EU could include decisions on the migration crisis and new elections in Spain. Although the January barometer could provide some interesting statistics of the performance in previous years, the overall direction of equity, bond and currency markets will be largely dependent on the announcements by the major central banks and other notable economic and political developments.